1. Larry Talbot's Cane from The Wolf Man. My interest in this prop isn't because I'm a huge fan of the movie. Don't get me wrong...I like The Wolf Man, but it wouldn't rank among my top 5 Universal horror classics. However, Larry's wolf-head silver cane--which ultimately becomes the weapon used to kill him--is just so cool. The actual prop was made of cast rubber and painted silver. Bob Burns, who has amassed a treasure trove of movie props, owns the original. Universal make-up artist and prop master Ellis Berman gave him the cane in 1948 when Bob was 13. You can buy replicas of it now. 2. Charles Foster Kane's Snow Globe from Citizen Kane. Yes, the Rosebud sled is the most famous prop from the movie, but let's be honest, I don't know where I'd store a sled. 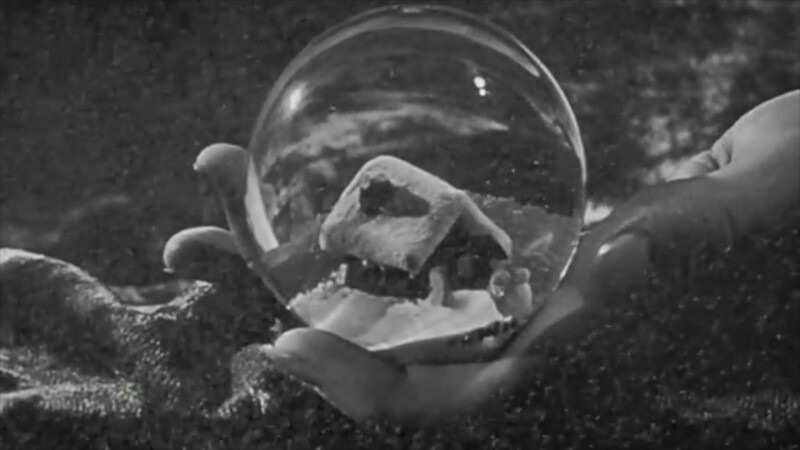 The globe, with its little snow-covered house, figures into one of the film's most iconic scenes as it falls from Kane's hand to the floor and smashes. You can buy a replica of it, too, for under $40. 3. The Portrait from Laura. 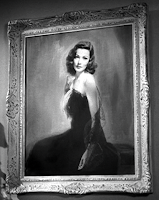 Who wouldn't want the famous painting of Gene Tierney hanging over their fireplace? Actually, it's not technically a painting. Director Otto Preminger didn't think portraits photographed well, so he had a photo of Gene Tierney "smeared with oil paint to soften the outlines." 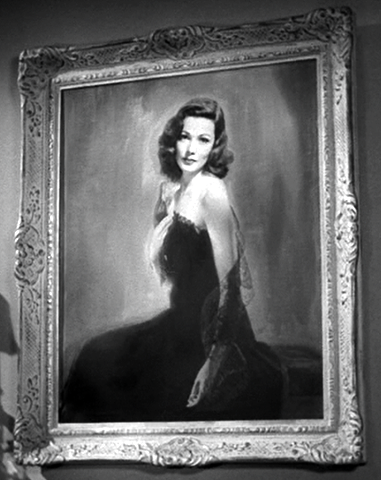 The "portrait" was used in two other films as well: On the Riviera (1951) (in which you can see it in color) and Woman's World (1954)--which doesn't even star Gene Tierney. 4. The Maltese Falcon sculpture. It may be the second most famous prop in movie history (topped only by the ruby slippers). A Las Vegas hotel magnate bought the original Falcon at auction in 2013 for $4.1 million. That put it way out of my price range! However, Vanity Fair later published an interesting article about other supposedly real Falcons used in the movie, too. It's all very mysterious. I'd like one, but, heck, even a solid resin knockoff on Amazon runs around $119. That's not what my dreams are made of. 5. 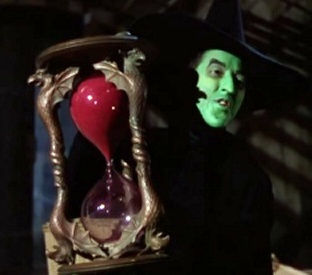 The Hourglass from The Wizard of Oz. Naturally, I thought about the ruby slippers and I even considered the big crystal globe in which the Witch spies on Dorothy. In the end, though, I opted for the hourglass because it scared the crap out of me as a kid when the Witch turned it over and told Dorothy: "Do you see that? That's how much longer you've got to be alive. And it isn't long, my pretty. It isn't long." Cool stuff. You have got me thinking. So far, the only thing I have come up with is the roll top desk in the press room in His Girl Friday. I'll ponder on this some more during the day. Woman's World does star Clifton Webb-who uses it as an example of one his conquests. What I wouldn't give for Larry Talbott's cane! After a back injury a few years ago, I have to use a cane occasionally, and you and I would have to fight to the death in an arena to get it! I also completely love the witch's hourglass. I think the red sand makes it even more frightening! Now if I could only have the entire Frankenstein's laboratory (it has to be around someplace, since they used it in Young Frankenstein), I could decorate my living room and be a happy woman! Loved this article, Rick. There was an episode of Lois & Clark called "Never on Sunday" where the villain was a stage magician, Baron Sunday, who was a real sorcerer. The props department mocked up a Baron Sunday press kit in a nice red folder with information about the character and black and white publicity photos which the characters at the Daily Planet passed back and forth while discussing the character's performance. 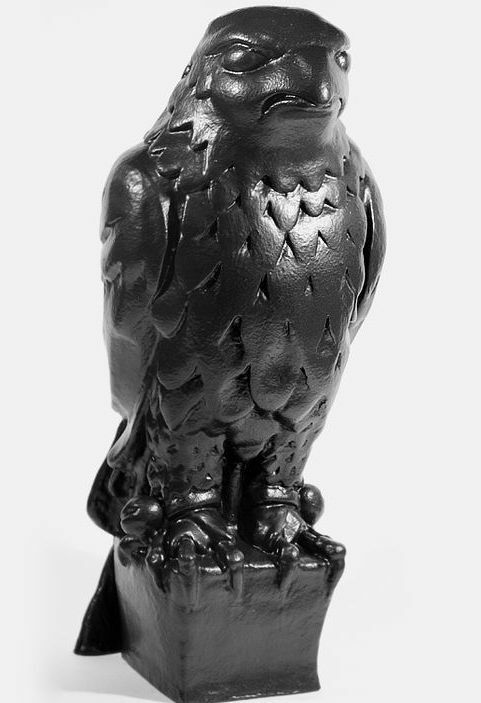 I have a plaster Maltese Falcon replica and love it. I would go for Larry's cane. Link? If you google "Larry Talbot cane replica," you'll get several dealers. I'm jealous about your Falcon. The golden idol head from Raiders. Something small I could carry around would be nice. The famous medallion depicting the lost island of Deryabar in 'Sinbad The Sailor' or the fabulous 'Topaz necklace' worn by Alice Faye in 'That night in Rio' (sigh). A large collection of Joseff of Hollywood prop jewellery went up for auction last November and the medallion and necklace was amongst the lots alas I discovered the sale too late to bid. Below is the web site where you can view the whole catalogue all 400+ pages of it. I recommend downloading the PDF version as it has better close ups than the flip page version. Thanks for the link! As for jewelry, I'd like to give my wife the diamond necklance Grace wore in TO CATCH A THIEF. It probably wasn't real, but it looked good. I'd love to have Barbara Stanwyck's typewriter from "Christmas in Connecticut". The mink coat would be nice, too. I believe that I read, that the "Laura" painting/photograph was owned by Robert Osborne and that he had it hanging in his living room. I would love to own the telephone that is in Peter Sellers, aka Henry Orient, in the movie "The World of Henry Orient." It happens to be one of my all time favourite movies. Love this post! The stark contrast of the red sand of the hourglass next to the Wicked Witch of the West’s green face is mesmerizing!